Why install an eSATA card into your computer just to connect your external drives when it already has USB 2.0 ports, and maybe even FireWire® 400 or FireWire 800 ports, too? Speed, plain and simple. The eSATA interface offers faster transfer speeds than those other connections—if you plan to work with files and not just back them up, you need eSATA—it delivers the fastest data transfers from storage devices with multiple interfaces(1). But, not all eSATA cards are alike. Sonnet's acclaimed Tempo™ SATA E4P eSATA host controller delivers outstanding performance and simple scalability previously unattainable with mainstream technologies. Tempo SATA E4P was designed with high definition video work in mind—its PCI Express x4 interface offers huge bandwidth for sustained data throughput of up to 240 MB/s per port, so the card never slows you down. It also offers unprecedented storage expandability—its support for high-performance multi-drive storage systems with port multipliers or hardware RAID controllers enable it to handle up to twenty hard drives(2)(3) at the same time! 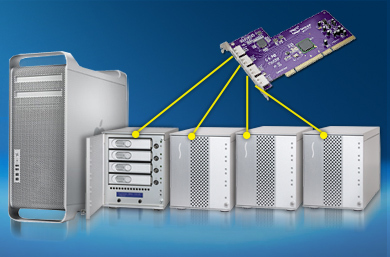 Port multipliers and hardware RAID controllers manage the data flow of up to five drives in one enclosure, transferring files between your computer and drives through a single locking cable. Connect four storage systems, and using today's highest-capacity drives, you can access an astounding 48 Terabytes of storage! For maximum performance, you can create a single, large RAID 0 set across multiple drives in two or more enclosures to capture and process uncompressed high definition video, or conquer other high-bandwidth applications. You can just as easily create smaller RAID sets to work with multiple streams of compressed video. For fantastic flexibility, you can work with 20 drives individually and hot-swap(4) them out as needed. You can even work with a combination of RAID sets and individual drives—your choices aren't limited. When your storage needs have outgrown standard solutions, get a Tempo SATA E4P—it'll give you room to grow and blazing performance for the most demanding applications. For maximum performance, you can create a single, large RAID 0 set across multiple drives in two or more enclosures like Sonnet’s Fusion D800P2, Fusion D400QR5, or Fusion R400QR5. Western Digital manufactures Desktop edition (WD Caviar, Caviar SE, Caviar SE16, and Raptor X) hard drives and Enterprise (RAID) Edition (WD RE, RE2, and Raptor) hard drives. Each type of hard drive is designed to work specifically in either a desktop computer environment, or connected to a RAID controller (hardware or software-based). If you intend to configure Western Digital drives in a RAID set, Sonnet and WD recommend using only their Enterprise edition hard drives. For more information, see this Western Digital FAQ. SATA drive hot swapping is not supported in a desktop or server PC running Windows. SATA drives connected to Tempo SATA E4P appear to the system as not-removable hard drives and there is no mechanism in Windows to prepare them for removal. Xserve not compatible with Sonnet SATA cable locking feature. Achieved with 16-drive RAID 0 set (four Fusion R400P storage systems). Tested using quad 2.66 GHz Mac Pro with 4GB RAM running Mac OS X 10.6, 1GB transfers. "Mac Pro users that are looking for a hard working SATA PM host adapter…will find the Sonnet Tempo E4P is an excellent choice." "…I was a bit hesitant to go with a port-multiplier system, thinking that it would adversely affect performance. But both disk subsystems perform extremely well, with the RAID able to sustain uncompressed 1080/60i HDTV without a problem. You could probably get a bit more performance by not using the port multiplier, but then you are limited in the number of drives you can connect, since the densest SATA controller I know of is just 8 ports. I'm satisfied enough with this that I'm ordering another to install into a new Mac Pro (Intel-based) system." "Sonnet cards are the best in the industry…Sonnet US based tech support is spot on if needed. In the 10+ years I have owned various Sonnet products, I have never had a problem, or a failure, or needed to call them for tech support. They work especially well in tandem, so make sure ALL your PCI cards come from Sonnet and you will never have any issues or conflicts." "Had a bit of trouble installing this in a 64-bit Windows 7 system, but Sonnet's tech support replied to my email within a few minutes. The solution was easy, and everything works as advertised."